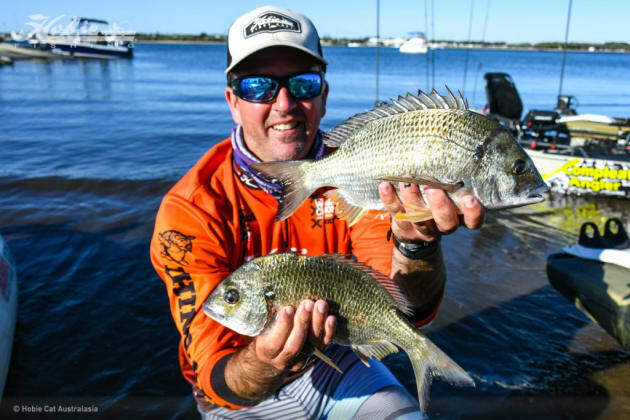 STRIKE Pro round 9 of Hobie Kayak Bream Series 9 was contested at the Gold Coast, in sunny Queensland, on the weekend of July 22-23. A Queensland record breaking field of 51 anglers from Queensland, the Australian Capital Territory, Victoria and New South Wales headed to the same stunning location where the 2016 Australian Championship was contested at the mouth of the busy Nerang River. On both days anglers headed off from the Power Pole starting line off Mitchell Park in Broadwater Parklands, located in Southport, at 7am. The weather was perfect throughout the tournament, with warm, sunny, winter weather, clear skies and temperatures in the mid-twenties (Celsius). The tide was just on high, as they blasted off on day one, and about an hour short of full tide on day two. The water temperature hovered around 20o Celsius across the fishing arena. On day one most anglers headed north toward Runaway Bay and other northern canal systems, Wave Break Island, Crab Island and further up to Paradise Point and Sovereign Island. A smaller group of around a third of the field pedalled towards the city skyscrapers to fish navigation markers at the edge of the main channel, the trawlers around the fish co-op, the Gold Coast Highway Bridge pylons and the pontoons and wharfs along the “Nerang” and its southern canals. Each day the bite was on right from the start and while those who headed north were still travelling, with kilometre after kilometre already under their belt, many with plans of attack that had them fishing closer to home, already had full bags of 4 bream. The pre-fish reports had been excellent with anglers bringing back news that there were plenty of good sized fish across the system. Predictions proved to be correct when the tournament got under way, with a lot of fish moving to the front of the river system and schooling in large numbers. Winter on the Gold Coast is spawning time when yellowfin bream head out off shore to spawn. They appeared to be gathering in heavy pre-spawn and lighter weight post-spawn schools, but either way they were hungry and eager to take to the lure temptations that were presented to them. The top 10 anglers shared total cash prize payout of $3,720 and over $2,500 in sponsor prizes were shared by Open and other divisional winners. To see who made the podium, click HERE.